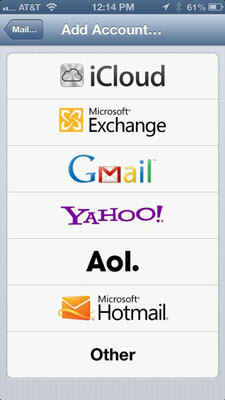 To use the Mail app on your iPhone, you need an e-mail address. If you have broadband Internet access (that is, a cable modem, FiOS, or DSL), you probably received one or more e-mail addresses when you signed up. You can automatically sync the e-mail accounts on your computer with your iPhone. 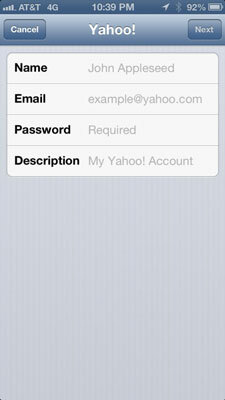 If you chose that option, your e-mail accounts should be configured on your iPhone already. 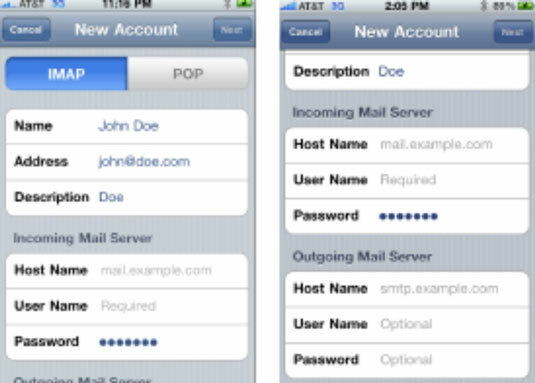 If you don’t want to sync the e-mail accounts on your computer, you can set up an e-mail account on your iPhone manually. It’s not quite as easy as clicking a box and syncing your iPhone, but it’s not rocket science either. If you have no e-mail accounts on your iPhone, the first time you launch Mail, you’re walked through the following procedure. If you have one or more e-mail accounts on your iPhone already and want to add a new account manually, start on the Home screen by tapping Settings→Mail, Contacts, Calendars→Add Account. Either way, you should now be staring at the Add Account screen. If your account is with Apple’s own iCloud service, Google’s Gmail, Yahoo!, AOL, or Windows Live Hotmail, tap the appropriate button on the Add Account screen now. If your account is with a provider other than the ones listed, tap the Other button. Enter your name, e-mail address, and password. The description field is usually filled in automatically with the content you have in the address field, but you can replace that text with your own description (such as Work or Personal). Tap the Next button in the upper-right corner of the screen. Your e-mail provider will verify your credentials. If you pass muster, that’s all there is to setting up your account. If your e-mail account is with a provider other than iCloud, Gmail, Yahoo!, AOL, Hotmail, or Microsoft Exchange, you have a bit more work ahead of you. You’re going to need a bunch of information about your e-mail account that you may not know or have handy. Scan the following instructions, note the items you don’t know, and go find the answers before you continue. To find the answers, look at the documentation you received when you signed up for your e-mail account or visit the account provider’s website and search there. Fill in the name, address, password, and description in the appropriate fields, as if you were setting up an account for iCloud, Gmail, Hotmail, Yahoo!, or AOL. Tap Next. With any luck, that’s all you’ll have to do, although you may have to endure a spinning cursor for awhile as the iPhone attempts to retrieve information and validate your account with your provider. Otherwise, continue with Step 4. Tap the button at the top of the screen that denotes the type of e-mail server this account uses: IMAP or POP. Some outgoing mail servers don’t need your username and password. The fields for these items on your iPhone note that they’re optional. Still, fill them in anyway. That way, you won’t have to add them later if your outgoing mail server does require an account name and password, which most do these days.